Josie, Val, and Mel have been bamboozled! After their dreams of stardom come crashing to earth at their first less-than-stellar venue, the band has to escape a bad deal with what else? A wild dusty dune buggy race across the desert. 'Josie and the Pussycats' #2 is a crazy, funny adventure that is high-octane laughs. Marguerite Bennett and Cameron Deordio let loose with an endearing story that is full of entertainment, action, and self-awareness. It's a barrage of asides, one-liners, meta humor, and jokes that keeps the book lighthearted and unpredictable. It's evident that Bennett and Deordio are having a ball writing the Pussycats' shenanigans. Amid all the fun, the Pussycats' personalities are allowed to shine. Their chemistry has come a long way since getting together in the first issue. Josie isn't the focal point and it really comes across as a team effort in telling the story. Val and Mel bring their own agency to the issue. They each have their own value and it shows in the third act. Contributing to all the fun, of course, is the dynamic and colorful art from Audrey Mok and Kelly Fitzpatrick. Mok's characters designs are so playful and distinctively stylish. From the Pussycats' attire to the local biker gang punk-rock style, Mok keeps it fun and varied. The layouts are never boring and the color scheme is bold and rich. 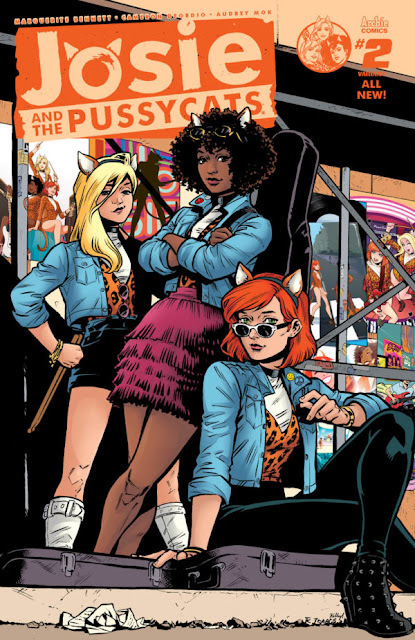 'Josie and the Pussycats' continues to evolve in issue two and succeeds at being a raucous joyride. Their road to stardom has been a little bumpy so far but there's nothing the Pussycats can't overcome. With endless charm, whimsical humor, and fun visuals, 'Josie and the Pussycats' is bound to put a smile on your face.